GeoPEARL runs for 6405 unique combinations of basic model inputs (soil type, climate district, land-use type, groundwater depth class etc.). Grid cells that share the same unique combination of parameters are referred to as 'plots'. During the creation of the spatial schematisation, results from a regional-scale hydrological model were used. In this way, it is possible to quantify fluxes and residence times of chemicals in the saturated zone. Also, it is possible to quantify the fluxes into local surface waters. Simulation of the increase of sorption in time is one of the options in higher tiers of pesticide regulatory leaching assessments in the EU to obtain more realistic leaching estimates. PEARL assumes a Freundlich two-site sorption submodel to describe non-equilibrium sorption: one site for equilibrium sorption and the second site for long-term sorption kinetics (non-equilibrium sorption). The operational definition for the equilibrium sorption sites is that they have reached equilibrium after about 24 h shaking of a well-stirred suspension of the soil in water. The long-term sorption sites do not reach equilibrium within 24 h. PEARL assumes first order degradation kinetics for the molecules present in liquid phase and sorbed to the equilibrium site. However, molecules sorbed on the kinetic site are assumed not to degrade. Conceptual representation of the PEARLNEQ model. 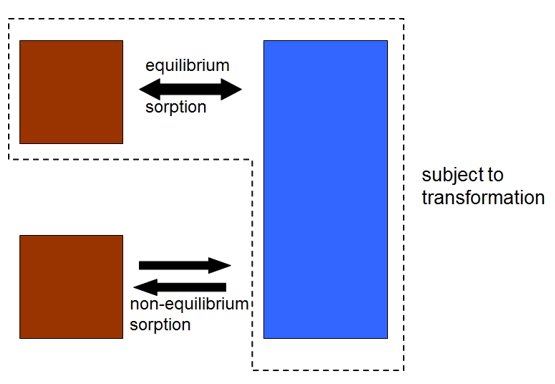 The rectangle on the right is the liquid phase and the two squares on the left are the two types of sorption sites. An important consequence is that the transformation half-life, which usually refers to the total mass content, should be obtained in a special procedure. Also estimates of the other non-equilibrium sorption parameters are needed. They can be with inverse modelling techniques and using long-term sorption experiments. For this purpose the PEARLNEQ software is developed. It contains the same two-site model as implemented in the PEARL model and the optimisation package PEST (Doherty, 2005) is incorporated in PEARLNEQ. The PEARLNEQ software can be used to obtain the half-life at reference temperature, the equilibrium sorption coefficient, the desorption rate coefficient, and the non-equilibrium sorption coefficient in the case of sorption/desorption kinetics. If the incubation experiment has been carried out at multiple temperatures, the molar activation energy can be optimized simultaneously. More than one data set (i.e. up to nine replicate sets) can be used in the optimisation process. An option is offered to define the transformation half-live on the basis of the concept that the transformation rate is proportional to the amount of substance in the liquid phase.